I guess this launch won’t be as smooth as Doom. 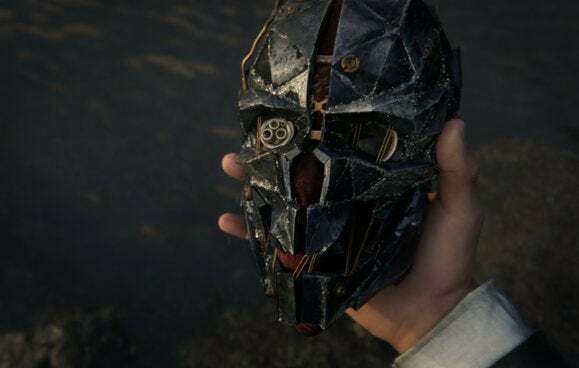 Update, November 11: With Dishonored 2‘s Steam rating down to 54 percent, Bethesda’s finally got around to acknowledging there maaaay be some issues, and a patch is on its way soon. Original story: Despite Dishonored 2’s official release date being November 11, it’s basically out now—at least if you preordered. Those who did already have access to the game, which means…well, the release date is just November 10? Right? In any case, performance numbers have started flowing in. Dishonored 2 ($60 on Steam) is running pretty well on my rig, which sports an i7-5820K and a GeForce GTX 980 Ti. On Very High settings at 1920×1080 I average around 90 frames per second, with it dipping to 70 in busy areas. Ultra drops that to 80-ish with dips to around 65 at times. Still playable, though I’ll probably stick to Very High. That 20 frame dip I mentioned above when entering busy areas? People are seeing that across the board, and if you’re barely hitting 60fps already it brings the game crashing down to around 40fps or even lower. And don’t think these people are playing on potato PCs. I’ve seen reports as low as 20 to 40 frames per second on a GTX 970…at medium settings. I can assure you, the game doesn’t look good enough to justify performance that poor. And then there are issues I can corroborate myself. Even with Dynamic Resolution set to 100 percent the game looks blurrier than I’d expect, as if it’s being upscaled. The mouse is a mess. 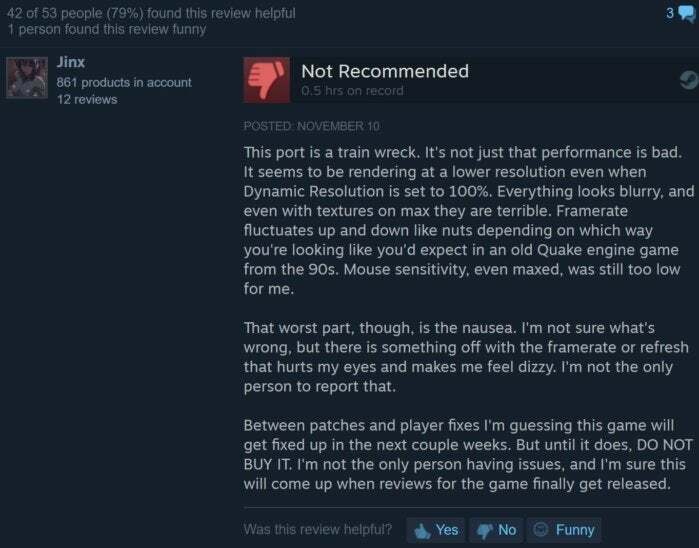 My sensitivity (and again, this is mentioned in Steam reviews too) seems to fluctuate all on its own, with it sometimes slow and cumbersome to turn and other times whip-fast, without me adjusting anything. I find myself constantly adjusting my G502’s DPI on-the-fly as I’m playing to keep it somewhat constant. Also—and this doesn’t has no effect on gameplay but rams home the “bad port” feel—on loading screens the mouse stutters and jumps around as it’s moved, even once the level is fully loaded. And the jumpiness isn’t limited to the visuals, as PC Gamer reports running into audio stuttering on several of its test rigs. As I said, it’s playable enough on my system. I’ll probably be churning through it over the weekend, trying to wrap my head around the story and do a real review some justice. (So far it seems fun.) 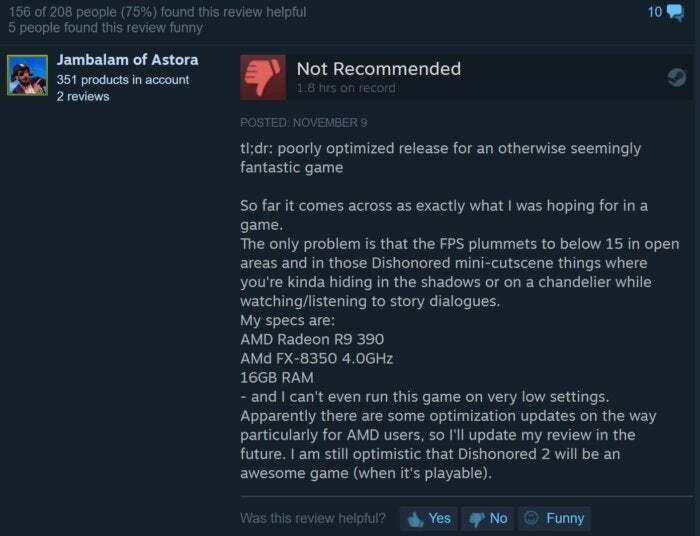 But issues are widespread enough it’s worth saying: Maybe hold off before buying yourself a PC copy of Dishonored 2. Give it a few patches.